Long distance trekking in cool-windy-dank conditions with weight on your back makes Tusker’s trek into Southern Chile’s Torres Del Paine National Park among its more challenging. On all other Tusker itineraries you don’t carry your clothing for five days in your pack, but on the W circuit trek you will need to be partially self-sufficient. That means packing with precision as well as being in prime physical condition. Although the trip is at relatively low altitude under 4,000 feet, there are several days where you will be on your feet upwards of ten hours covering distances up to 20 kilometers. Sections of the most beautiful trails require bouldering so you need to be at your most agile and flexible. Get those knees, back and shoulders as strong as they were when you played varsity sports. Start training now. Few of the hikers on the Tusker Patagonia trek are experienced backpackers, but you will need to summon a backpacking mentality and physicality for this trip. Backpacking has changed a lot in the last two decades or so. It’s no longer about toting 50 pounds in an external frame pack while wearing Frankensteinesque boots to support that burden. We are now in the era of super-light backcountry travel and you would be surprised that you can spend five days on the trail with 30 pounds or much less. This is a liberating less-is-more movement, but necessitates the right gear and training. Torres Del Paine has been the province of serious backpackers and mountain climbers for four decades. Due to its popularity, park officials carefully limit travel in the sensitive backcountry that is a combination of lower wet boggy areas, drier pampas grasslands and as you climb, rocky terrain under the iconic horned peaks or towers that make this park a bucket list destination. Unlike all other Tusker long distance treks in Africa and Asia, porters are limited here because of these environmental considerations. That means that Tusker transports some of your gear, and trekkers carry some of the gear they need for the five days in the Torres Del Paine backcountry. The group hikes between various covered refugios where they overnight. The refugios provide bedding but among the things you should bring is a sleeping bag liner. 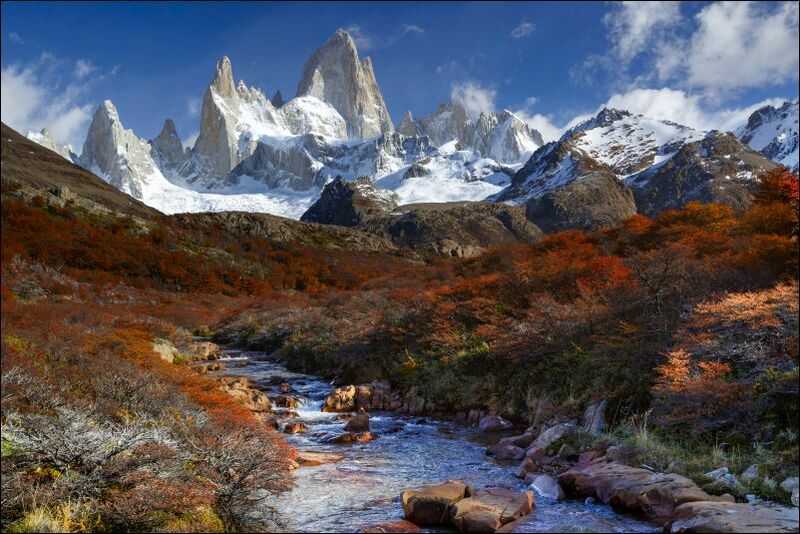 There is no camping on this trip or the extension into Argentina’s Patagonian national parks. Your hiking pack needs to be big enough to carry everything you require while in the backcountry. That means one change of clothes, rain gear, rain pants, DOB kit, and space for snacks, water bottle, camera, binocs, journal and sunscreen. We recommend a pack that is larger than a standard day pack but smaller than a full size 65 liter backpack. These packs contain 30-35 liters and several companies including Kelty, Gregory, Osprey, Patagonia and Deuter all have large day pack models that could work in Torres Del Paine. To prepare for this trip it would be wise to take your day pack and fill it with the clothes and gear you will take on the five day W circuit trip. Then spend quality time with it on training hikes in your local parks and mountains. Take some long hikes over various terrains so you can adjust to hiking with weight. If you have never hiked with weight it’s not a great idea to see how it feels in the Torres Del Paine backcountry where wind and wetness adds to the difficulty. Test your gear on these training hikes so there are no surprises in the Patagonian backcountry. Hiking with a light day pack compared to hiking with weight is almost a different activity. Your balance is affected so you need to be comfortable with extra weight on your back. If the pack is not the right fit you will feel its negative effects on your shoulders, back and hips. The key is always to have the pack’s weight on your hips and not your shoulders. For this to happen your pack needs to be properly sized for your torso, and well-adjusted on your hips, but not tight in the shoulders. A good waste buckle with adjustable straps is the way to go. Before you travel, weigh your pack with all your stuff in it. It should weigh 30 lbs or less. There are many ways to reduce weight. Don’t take a big bottle of sunscreen in your pack, but a smaller bottle that can last for five days. Do not take a bulky camera on this trip with heavy long lenses. Go modern with a light weight digital camera. Even avid photographers complain they took too much camera gear on the long day hiking up the park’s French Valley. While it is insanely photogenic, it also requires jumping on and off boulders and less weight means less stress on those balky knees. There is no place in the U.S. to train, that mimics Patagonia’s capricious weather and typography. Parts of the Pacific Northwest and Alaska have some of the Patagonian elements, but this is a unique place. You must be prepared mentally and physically for sudden harsh weather changes. Patagonia’s winds are notorious. You can be hiking in calm bright sunshine, but when the wind comes out of nowhere it can bring rain with it. But the sun may be a bigger threat. You are hiking in extreme southern latitudes and the ozone hole in the Antarctic emits ultraviolet rays that are among the most damaging in the world. This necessitates maximum quality sunscreen with a high SPF rating, quality UV protecting sunglasses and a wide-brimmed sunhat. Just because it’s cloudy doesn’t mean it’s blocking all those UV rays so stay lathered. If you have packed correctly you have quick access to your rain paints, rain shell and pack cover. They need to be water proof not just water resistant. Zippered rain pants make them easy to get on and off. The key here is to be able to adjust as quickly as the weather changes. Dress in layers with a light merino wool or poly body shirt. Find yourself a mid-weight alpaca sweater while you’re in Punta Arenas, the trip’s departure city for your warming middle layer and a two layer Gore-Tex rain shell to keep the wind and rain off. A good fitting well broken in pair of mid-weight hiking boots that have been waterproofed just before the trip are essential. You will spend the better part of five days on your feet and your boots must be your best friend and perform well to fully enjoy this trek. You are traveling to a place where legends have preceded you. From Yvon Chouinard to Butch Cassidy and the Sundance Kid, Patagonia has been a place of refuge and personal discovery. It’s a chance to push yourself in a magnificent setting at the ends of the earth. This requires the kind of can-do-anything attitude that overcomes any fears you may have about weather and the arduous long days on the trail. Do your training, have the right gear and travel with the spirit of the explorers who have come before you. Patagonia is still a relatively undiscovered destination so have an open minded/wide-eyed zeal for this watery land of icy capped peaks, glaciers and endless lakes. Do your homework and have a sense of where you are going, but leave the guidebooks at home. Pack light, travel smart but do it with a sense of wide-eyed adventure.